This post is about two types of "Fresh" and also my G, of course. G has been coughing (with phlegm) for the past one month, he is very prone to phlegm, and when he coughs (with phlegm), I'd get very scared coz he would cough, and then *eeekkk* vomit already. But people say it's good babies know how to "cough out" (vomit) the phlegm, rather than "keeping" inside. As usual, one afternoon, G is having his afternoon nap. Then, he coughs. One time. I'm ready already. I'm already holding the potty next to me, waiting for his second cough. 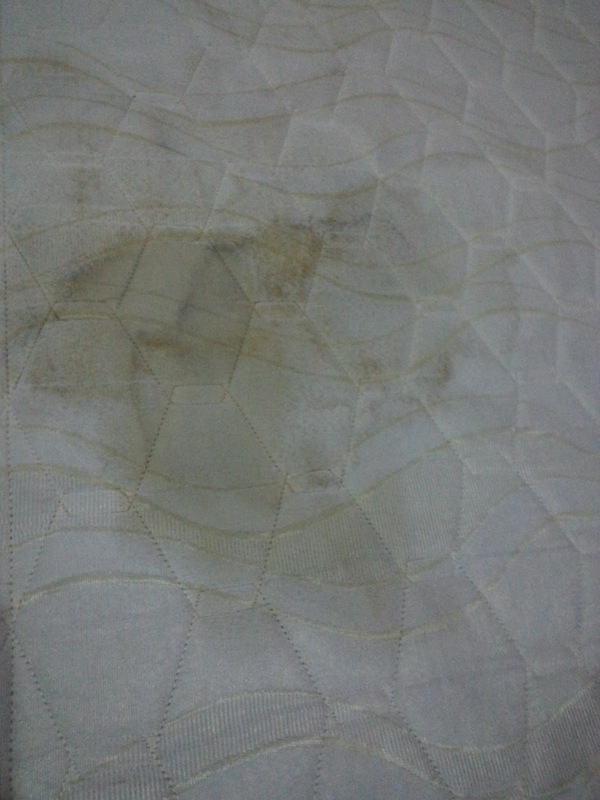 Then before I can hear his second cough, he vomited on the bed already. Arrrgh, I got no choice but to wake him up, change his clothes and bedsheet right away. I bet you can imagine the smell. Then I remember I have a bottle of Bed Fresh which I put in G's room. I grabbed it, and sprayed on the mattress. Bed Fresh is designed to eliminate mites and bed bugs, it also has sanitizing effect to get rid of any bad smell on the bed, couch, curtains, everything. 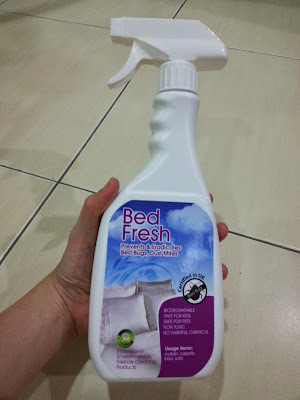 Bed Fresh is: biodegradable, has fresh fragrance, eliminate odors, non toxic, safe for kids, safe for pets and MOST importantly (for me, coz I have mild OCD), it's anti bacterial. 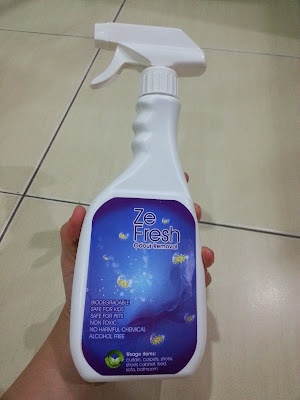 And, few days ago, I gave a bottle of Ze Fresh to my hubby for him to spray in his car. His car stinks! No, not from smoke (he doesn't smoke), but he sweats a lot, and the whole car stinks. Imagine all his sweat absorbed into the cushions. 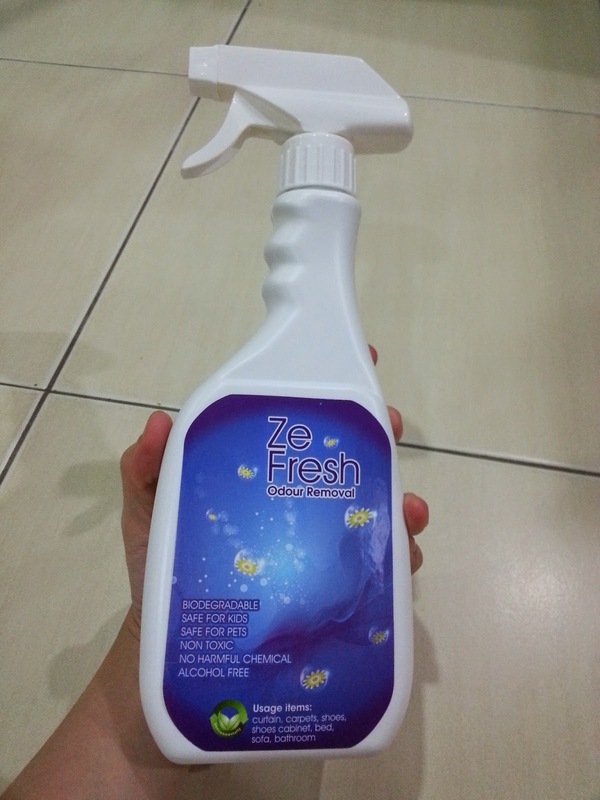 Ze Fresh is proven to protect against bacterias and it is designed to help absorb all kinds of nasty odor. No, I'm NOT advertising for these products, and no, am NOT selling these products too, but I share it in my post today because I feel all, yes, I mean ALL households need things like these, especially if you have kids (they vomit and spill food/drinks everywhere, on the couch, bed or even in the car), you would find these products useful. It's available in Village Grocer @ Sunway Giza mall, or contact mandy.plincco.com, or just call Mandy at +6012 396 6388 (to see if you get anything free, again, teehee). Oh, back to my G pie, here's G, making his manja face each time he wakes up from his nap. He still loves to lie on my chest and sticks to me like a koala, and I'm sure I will miss this feeling when he stops sticking to me like this anymore one day. Ignore my ugly face, ugly hair and ugly pyjamas. I look like this at home most of the time. wah.. G is coughing ah?? maybe also because of the weather?? the haze is coming back leh.. aiyoh, nowadays the haze is like another type of weather in KL just like rainy days and sunny days and cloudy days, we also have hazy day..
dunno why la the haze is getting more frequent and serious lately.. I remember last few years it was like just once in a year, but now it's like coming back on and off throughout the year lor.. and guess now not just the neighboring country that caused the haze but also our own plantation and construction in the country lor..
last week was "9 wong yeh" and rained heavily every afternoon so we won't see the haze but now "9 wong yeh" is over jor, no more raining, sure the haze coming back again and many people fell sick because of that..
oh what is that "Fresh" thing?? so you got another company who gave you their products to try and you write them a complimentary review post ah?? 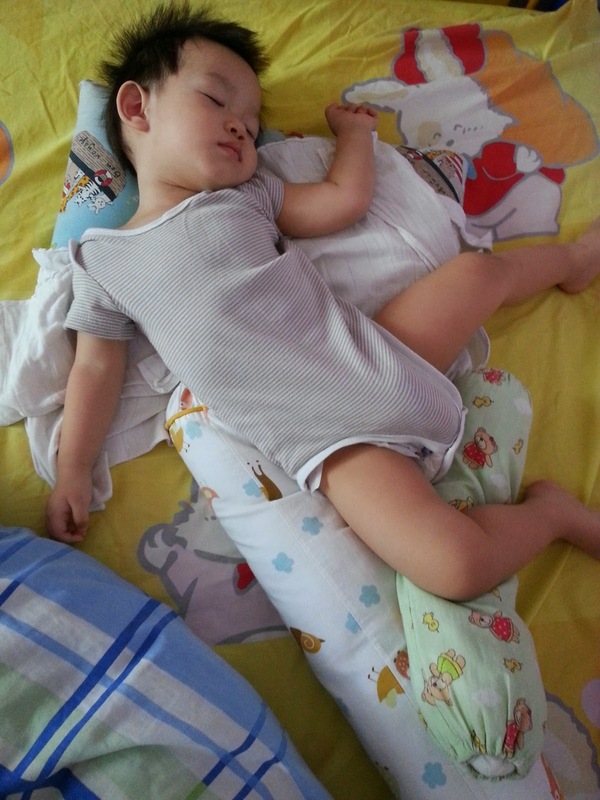 wah, the last photo, so like those advertisement photo lor, baby boy laying on the mother.. hahaha!!! 1) Wah wah wah, "siew kin" wor, so early come here liao, I'm very happy oohhh.. G coughs often and has a lot of phlegm from birth.. Maybe I ate too much cold stuff when I was pregnant with him..
2) Yep, I am wondering the same.. Everyday already rain like h*** wor, still got haze wor the next day.. Like not logic..
3) Even with the 9 wong yeh, it still gets hazy the next morning leh.. There was a few days like this..
4) Aiya, I never bother bringing G to the doctor, coz he will give the same thing again - cough+phlegm syrup. Too much medicine is not good.. So I just feed Chinese bou-ying-dan, and "taan" pear+white fungus water for him lor.. Steamed oranges once a while.. Like that lor..
5) The "fresh" thing are: Bed Fresh & Ze Fresh, it works like Febr**ze. Errr, yeah wor, some nice pretty lenglui gave me free products again wor, so well, yeah, gotta write about it.. Plus, I think all household and aunty bloggers here will like to read kua. Borage leaves? Never heard before.. I usually just steam oranges.. But ok, I will find out about the leaves.. I heard my colleagues saying the same thing, boil some leaves in water, maybe they are talking about the same type of leaves..
Oh? Gotta look out for these. Not sure if they have them here - sure would come in handy. Lots of mites, not visible to the naked eye - one would not know they are there! Very nice last pic that one, oozing with love! Ooh, yeah, I love the last photo too, manja face, hehe..
Haha, very funny la you.. Oh yes, your mum's right.. I guess when G's no longer sticking with me like this, I will miss this feeling too..
Really? Ya lor, cough until vomit leh, don't play play.. It makes a mess especially when we want to go out, or when we are outside.. Scary oohhh.. But I look very ugly in the last picture.. Hehehe.. Both my kids also like that when they are young. They will vomit when they cough too much. Wah ...you look pretty in the last pix. Chris, yau mou? I look pretty in the last pic? You must be kidding.. My hair is all pulled up using the hair band like an aunty, and wearing "harm choi" pyjamas.. Oh yes, I very scared when they cough, coz they will vomit after that, but it's good to vomit out all the phlegm lor.. I hope that little G is feeling now... My husband and son were infected with a viral bug om last weekend and vomited a lot too... Now, I'm like you and have extra extra washing to do too. This post is interesting. Even the title is hilarious as it sounds like an underwear topic I read somewhere. Fresh & G sounds like underwear ahh? Maybe it sounds like G spot, or G string? hehe.. Yeah hubby stinks, but touch wood, no BO yet, but I guess if he continues to be like that, he will get BO soon.. Yucky..
You might think I always talked craps. Try to google this - Fresh G strings. I heard before some blogger said it. Anyway I am not sure what is the difference between body stinks and B.O. Yeah who likes BO rite.. 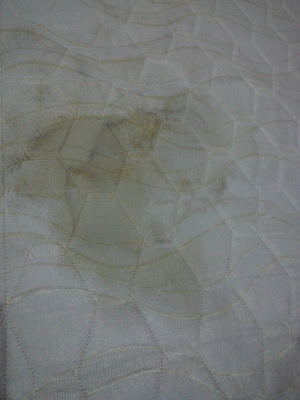 But hubby really sweats a lot, then drives home after that, imagine all that thingy absorbs into the cushion.. Sigh.. Yeah I have a lot of F******* at home too, just different fragrance only, hehe..
You look fresh and young. What do you mean ugly. Haha. My Jamie also want vomitting last week and I hate the smell. I also spray fabric deodoriser on my bed to eliminate the smell. I guess all babies are the same.. Better if they can vomit out hor.. Yeah, after each vomit, I got no choice but to wash the bedsheet, and then spray F******* on the matress.. Thank you wor, for your compliments.. But not as sweet & petite as you though..
Yeah, I tell myself that each time my blood gets boiling.. I tell myself after that moment pass and they grow up, I might miss that feeling..
My boy used to cough too when he was young. He coughed loud and vomited. After the vomit, he actually felt better as all the phlegm came out. Yeah, agree, G feels better after the vomit, and won't cough/vomit for a long time, can last more than 4-5 hours before his next cough/vomit.. Thanks for sharing. I love the photo of you and G, so loving together. Yeah, G is very manja, more manja than his elder brother..
What a cutie! Kids are adorable when they're asleep - they look so innocent. Yes yes yes! 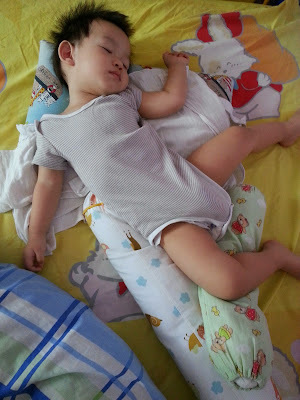 I like to look at them when they are sleeping, gawd, now I miss them so much, hehe.. I usually use Febreeze only, hehe. Eh you where got ugly la!! Very sui leh! Almost everyday sure got 1 vomit case.. Nomatter how prepared or how ready I am (holding the potty standing by), somehow still will kena the bed or sofa one.. Haizzzz..
That's a sweet picture of mother and child. I read that children like the warmth and to hear the heartbeat of the mother - brings him back to the cosy and safe days when in the womb. Vomit normally translates to too much wind inside and milk normally has a lot of wind. Orange juice also has a lot of wind. Just my two cents. Yes, cleaning up after can be yikes!! 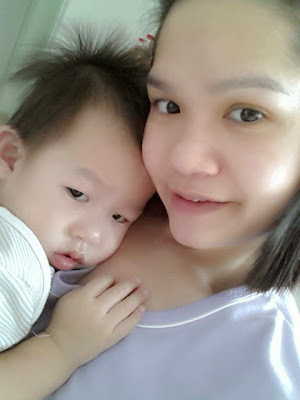 Seldom feed him orange juice, he dislikes orange naturally.. Oh yes, babies like to stay close to the mum's heartbeat.. Maybe I should do the same (by force) to Kz and see if he wants to listen to my heartbeat, keke.. If it's vomit ahh, I bet you will run 500m away, haha! Yep, it can eliminate nasty smell quite fast, so am keeping it.. But it's not easily available though.. Maybe, just maybe, I'll stick back with the regular commercial F brand..